Taking good care of laminate flooring is not that difficult if you know what the appropriate cleaning tools are. You probably know that the classical bucket-mop combo isn’t the best thing to go for. That’s when a laminate floor mop comes into play! You certainly would want to get the best mop for laminate floors. But how do you do that? Well, make yourself comfortable, and let us guide you through the intricacies of laminate floor mops that you should know about! If you have hardwood floor, check out our hardwood floor mop guide. 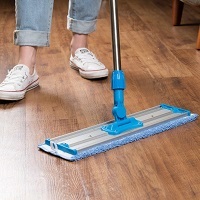 What makes a good laminate mop? 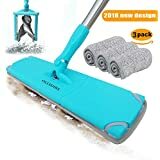 What would be the best mop for laminate floors? Well, the answer is simple: pretty much any mop could be used for taking care of laminate floors. 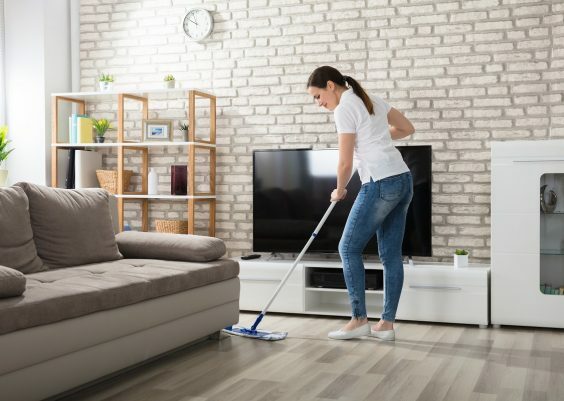 However, there is one thing that you need to bear in mind: laminate floors are sensitive to water, so the absolute best mop would be the one that doesn’t make water puddles while cleaning. Microfiber mop is simply the best to use on laminate flooring. Steam mops clean floors by producing steam and require water for operation. Due to the boiling temperature of the steam, steam mops are exceptionally effective in killing various germs and bacteria. Apart from that, steam mops work very well against tough stains. The biggest advantage of steam mops for many is that they don’t work with any chemicals, which on one hand allows retaining the floors’ condition, and on the other doesn’t produce any odors. However, with a steam mop, you will have to think about the maintenance of the water tank. Besides, you should use distilled water with a steam mop if you don’t want it to have mineral buildup on its components. Please note that steam mops have variable heat control. The lowest heat setting should be the safest for laminate flooring. Spray mops work by spraying a cleaning solution in front of the cleaning head. Then, you just pass the mop over the area to clean it. Spray mops are ideal if you prefer to work with your own custom cleaning solution. However, with a spray mop, you would need to be careful with the solution you are using. You will have to make sure that you aren’t using something that is damaging for the laminate. As the name implies, spin mops employ spinning cleaning heads to treat floors, including laminate. Spin mops are mostly dry, i.e. they don’t work with any water or solutions, though some models can be spin and spray mops two-in-one. Spin mops are great for regular dust, dirt, or moderate stain cleaning. However, when it comes to those really tough, sticky stains, they mostly won’t be able to help you get rid of them. A dry mop is the most basic kind of a mop you could get for your laminate flooring. They are very good for getting rid of regular dust, as well as debris like pet hair or fresh spills. However, tougher stains will be a challenge for microfiber mops. A dry mop would be ideal if you want a lightweight and simple floor mop. Apart from that, a dry mop would be a good value if you don’t need the benefits of the other types. The best mop for laminate floors needs to have features that can satisfy your requirements. The “best” will be different for each and every one, so you will need to see into your demands to find the best laminate floor mop out there. The very first thing people look in laminate floor mops is easiness of use. Apart from making the use of the mop much easier, convenience can have a strong impact on its overall performance. Manufacturers come up with various ways of making their mops more convenient, and covering all of them isn’t quite possible. However, we can point out a couple of features of laminate floor mops that could make your life much easier. Adjustable handle height. Not a necessity for everyone, albeit short or tall people would benefit from such a handle the most. If the handle is too short or long for your height, you will probably face some inconveniences when using the mop. Besides, adjustable handle height can allow you to reach far corners under the furniture. Swiveling cleaning head. Most typically, modern mops feature fully swiveling head joints, allowing you to easily maneuver when cleaning the floor. You probably won’t meet any mops that don’t have this feature but make sure that the mop you choose has it. Cleaning head size. If you have a lot of low furniture in a room with laminate flooring, you should be looking for a mop with a compact cleaning head. This especially concerns steam mops because they are much bulkier than other mop types. Cleaning head shape. When it comes to accessing corners, rectangular and triangular heads are superior. Round cleaning heads aren’t quite capable of covering corners, so you might want to avoid them if you wish to really cover each inch of your flooring. You would obviously want a mop that works for a long time. Unfortunately, it isn’t really possible to evaluate how durable the mop will be by just reading through the product description of the mop. The best way to do so would be to read user reviews. Light weight is a solid advantage for any mop, even more so if you have mobility issues. If you are really concerned about how much your laminate floor mop weighs, a dry or spray mop would be the best. Steam and spin mops usually aren’t very light, so avoid them if light weight is important for you. 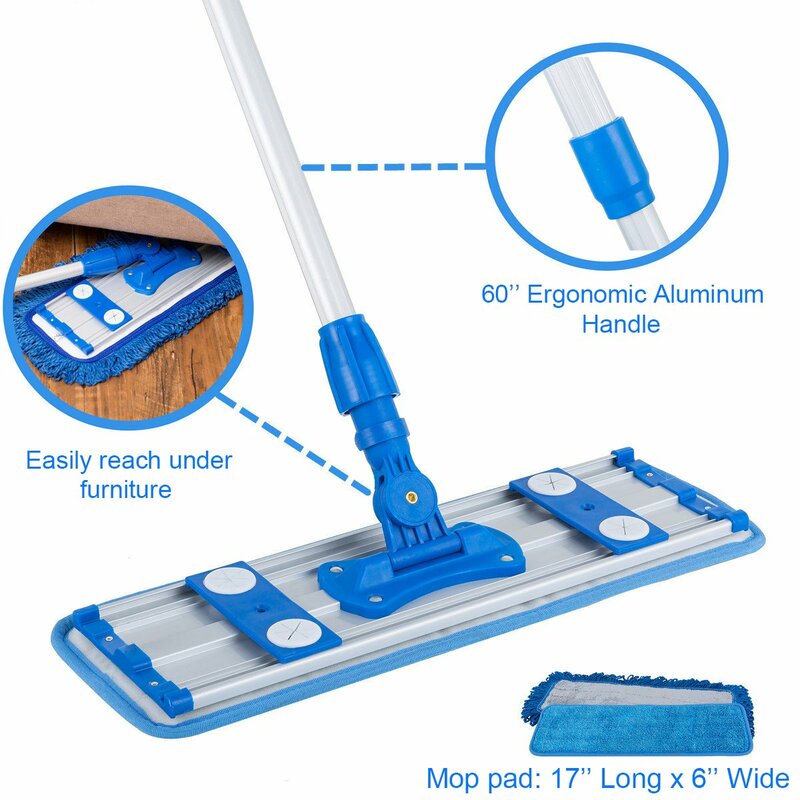 Mop pads are crucial to have with a laminate floor mop. Manufacturers typically include a couple with their mops, but there are a couple of things you should be mindful of. Firstly, make sure to check on the availability of mop pads. Even reusable mop pads won’t work forever, so you better have options of easily getting new ones when necessary. Secondly, it would be good if the mop came with at least 2 mop pads. If it comes with only one, you will have to wash it at least once during long cleaning sessions. For time-saving, 2 and more mop pads would be ideal. It would also be good if the mop came with different kinds of pads, e.g. 1 wet and 1 dust. This will add a bit of versatility to your cleaning and will allow you to take care of the laminate better. 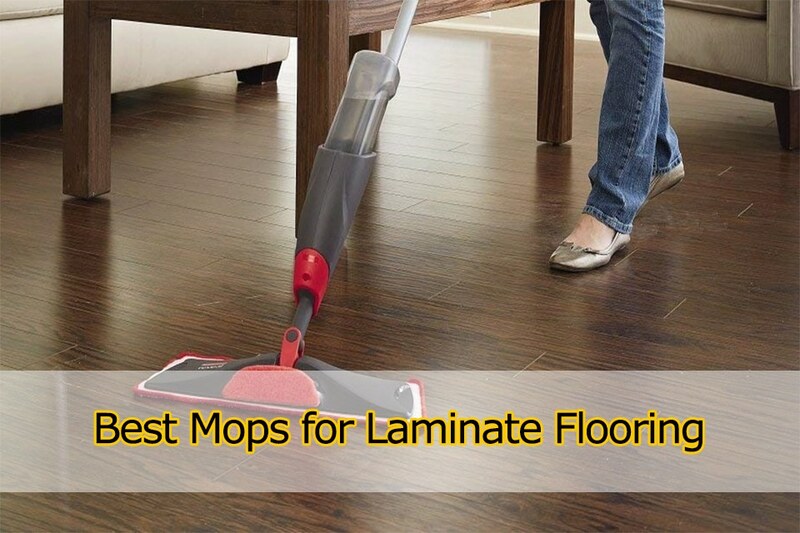 These 10 mops for laminate floors will clean your laminate flooring quickly and easily. The Professional Microfiber Mop is a great example of a dry mop. It is simple yet has everything necessary for good laminate cleaning. 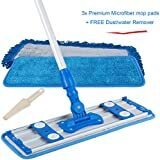 Microfiber Wholesale includes 2 microfiber wet mop pads, 1 microfiber dust mop pad, as well as 2 free microfiber cloths as a gift. The dry microfiber dust pad is designed to pick larger debris like dirt and pet hair, as well as dust, obviously. Notably, all of the mop pads are machine-washable. When it comes to convenience, the Professional Microfiber Mop is great as well. It features a fully swiveling head and an adjustable stainless steel handle to help you with accessing distant corners. 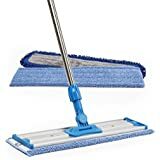 As simple as it is, for regular dust and light stain cleaning, this Professional Microfiber Mop will be a worthy choice. When it comes to dealing with germs and tougher stains, a steam mop is a nice choice for laminate floors. 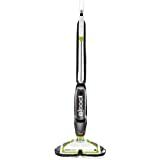 And Bissell PowerFresh is an excellent example of a steam mop! The PowerFresh is equipped with 3 steam settings – high, medium, low – for messes of different difficulty. It also has quite a capacious 16oz water tank to supply the mop with hot steam for the cleaning. 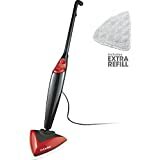 In terms of flexibility, the PowerFresh steam mop works spot-on since it has a fully swiveling cleaning head, though reaching far corners under low furniture might be more difficult due to the bulky cleaning head. 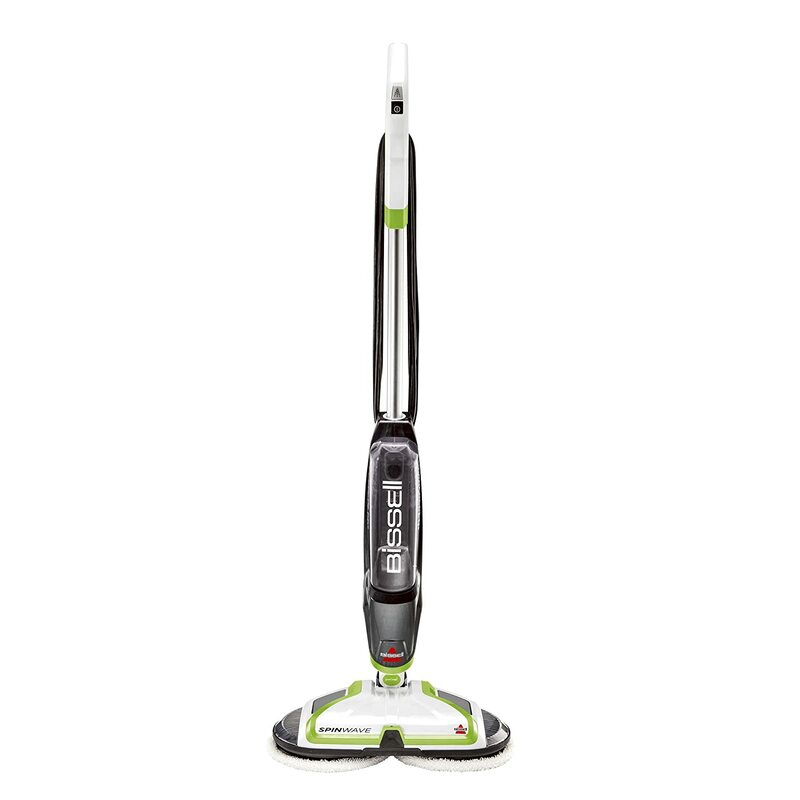 Bissell equipped their mop with an easy scrubber to aid with dealing with harder stains. In fact, Bissell claims that the scrubber speeds up the cleaning up to 2 times. It will be highly situational though, so don’t take it for granted. Built-in scrubber for hard stain cleaning. Includes 2 mop pads and 4 fragrance discs. 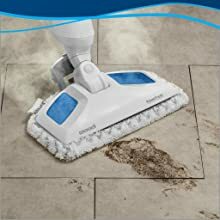 SKG Steam Cleaner truly offers great value for the price. 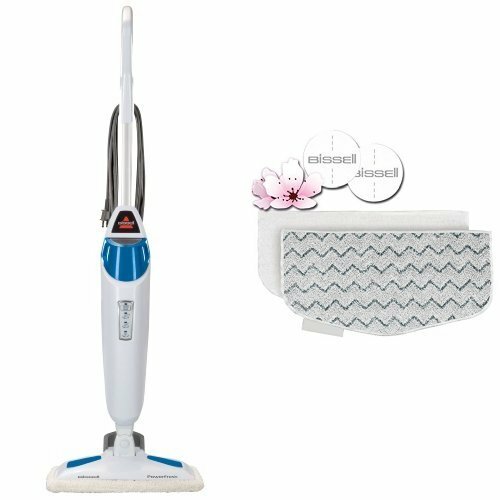 This steam mop can be used in cleaning a variety of surfaces thanks to the abundance of included accessories. With the snap-on carpet glider, you can safely and conveniently take care of carpets. The various attachments allow you to access nooks and crannies, as well as easily reach confined areas. The water tank unit of the Steam Cleaner can even be de-attached for easier cleaning of tables. 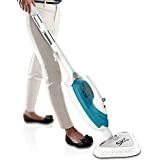 Another noteworthy feature of SKG Steam Cleaner is its triangular head, which makes cleaning laminate flooring under furniture noticeably easier, especially corners. It also has an adjustable handle and 180-degree swiveling head for even more convenience. ALLZONE microfiber mop is very similar to the Microfiber Professional Microfiber Mop reviewed in the beginning. However, there are some minor differences between the two that could be decisive for you. Firstly, ALLZONE mop is almost half the weight of the Microfiber Professional unit, weighing 2.75 pounds. 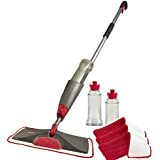 Secondly, it comes with a scraper cleaner tool to facilitate the removal of pet hair and dirt from the dust mop, as well as squeeze the wet mops. This certainly adds to the easiness of use of the mop. Another thing this microfiber mop can do is working with regular pieces of cloth. This is possible thanks to the clips that could be adjusted to the size of the cloth you wish to use. Comes with a scraper cleaner tool. A spin mop is a perfect choice if you want effortless cleaning. Bissell Spinwave does it well: you just turn it on and push it over your laminate floor. Bissell included soft and scrubbing pairs of cleaning pads for gentle cleaning and dealing with tougher messes. Those pads can be stored right on the machine, in its pad storage tray. Additionally, it is equipped with a cleaning solution spray to allow you to increase its effectiveness quite a bit, depending on the solution you use. Another solid advantage of the Spinwave is that it is powered by a battery. No more messes with lengthy cables! However, 20 minutes of battery time might be insufficient for you if you have wide spaces at home. 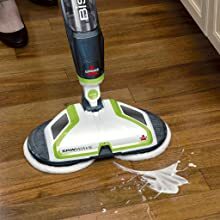 And yeah, it should be noted that the pads don’t put too much pressure on the flooring, which could compromise the Spinwave’s performance when dealing with tougher messes. Includes washable soft and hard cleaning pads. Can spray a cleaning solution on the laminate. 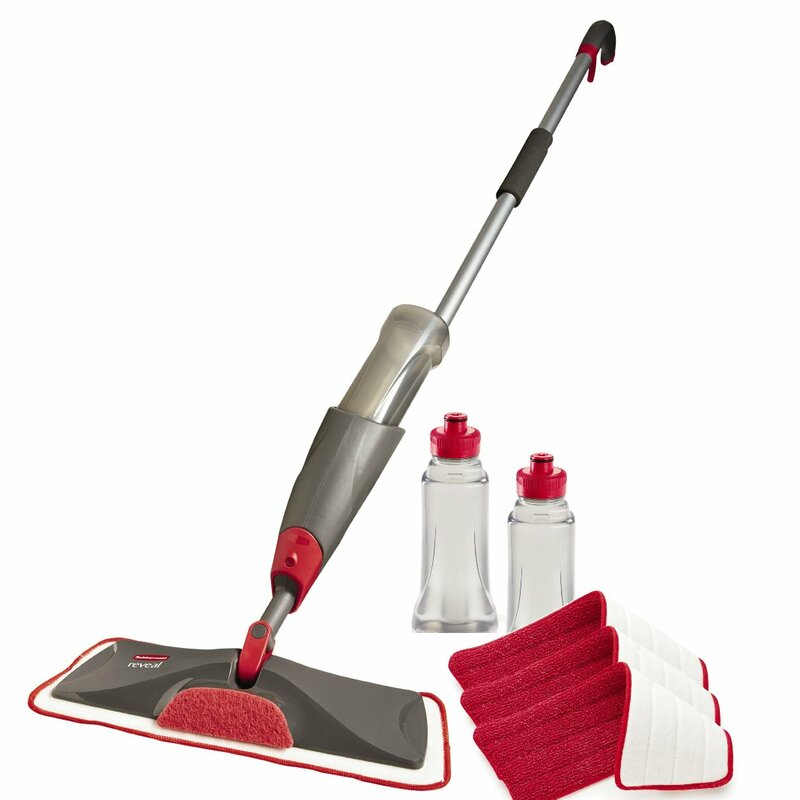 Rubbermaid Reveal Spray Mop allows you to disperse your cleaning solution on the floor with just a pull of a trigger. No need to repeatedly bend down while cleaning your laminate floors! The Reveal spray mop is fit with a 22oz bottle that you can fill with any kind of cleaning solution. That’s the thing that many people love about spray mops: they are convenient like steam mops but at the same time allow you to use custom solutions. And because the bottle is removable, filling it with your cleaning solution will be very easy. 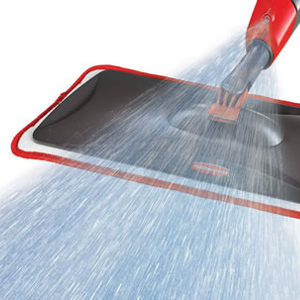 For stubborn spots, Rubbermaid equipped the Reveal Spray Mop with a non-scratch scrubber on the front of the cleaning head. And since this is actually a kit, Rubbermaid includes 3 washable microfiber pads, as well as 2 refillable bottles. The 2 bottles will make cleanings even more convenient since you can just fill both and clean longer. Inbuilt scrubber for stubborn spots. Comes with 3 washable mop pads and 2 water bottles. This one is also a dry microfiber mop, but it differs quite a bit from the others we reviewed earlier. Firstly, its mop pads feature four loops at the corners, through which they are attached to the mop. OLLSDIRE views this as an alternative to the regular Velcro, which often wears out and prevents the attachment of the pads to mops. The loops are designed to address this issue. Secondly, OLLSDIRE microfiber mop features a pad squeezing mechanism. You just need to release the handle lock, lower the ends of the cleaning head so the pad hangs loose, and rotate the handle until the pod is dry. This allows you to squeeze the pad without removal. In terms of flexibility of use, this microfiber mop is pretty close to the others. It has a fully swiveling head but doesn’t have adjustable handle height, which could somewhat compromise the mop’s easiness of use. Loop mop pad attaching instead of Velcro. Easy to squeeze the mop pads dry with. Comes with 3 mop pads. What stands out the most in Temples Pride Professional microfiber mop is its cleaning pads. They are super-absorbent, which makes them effective not only against dirt but also bacteria. 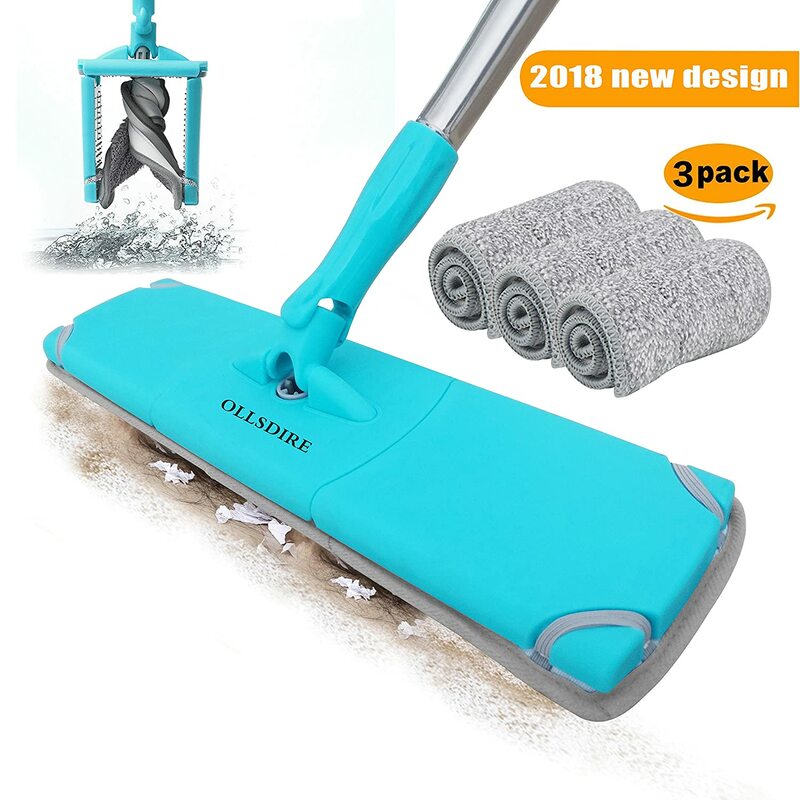 When it comes to other features, this microfiber mop is excellent as well. 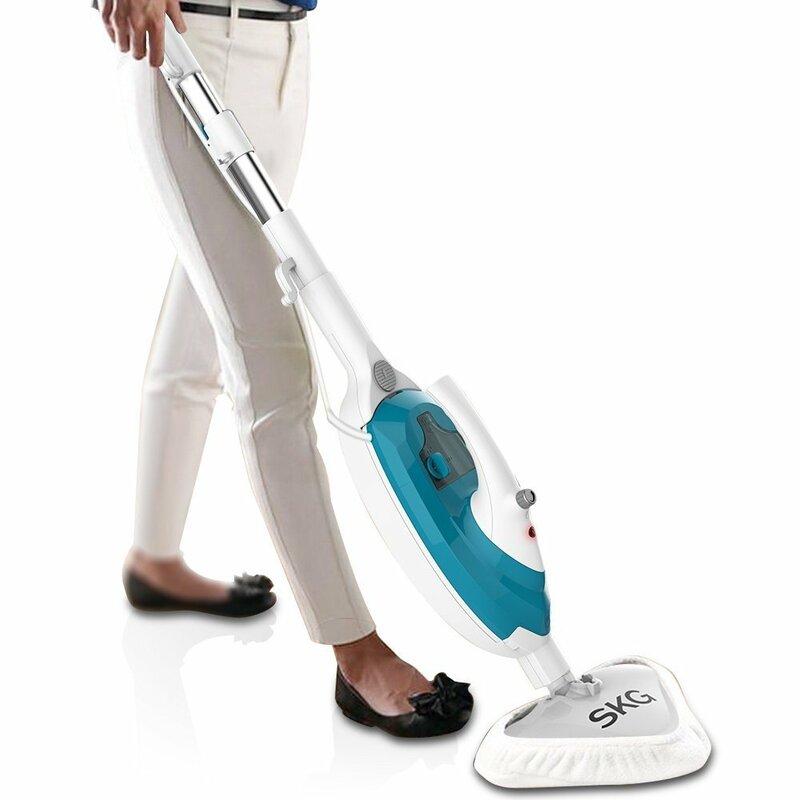 It has got a fully swiveling cleaning head joint, as well as a height-adjustable handle. In addition, Temples Pride includes a narrow scrub brush to help with nooks and crannies. This mop also weighs only 1.54 pounds, quite a bit less than the other microfiber mops we examined. If you are looking for an as lighter mop as possible, this one will be a perfect choice. Includes a narrow scrub brush. 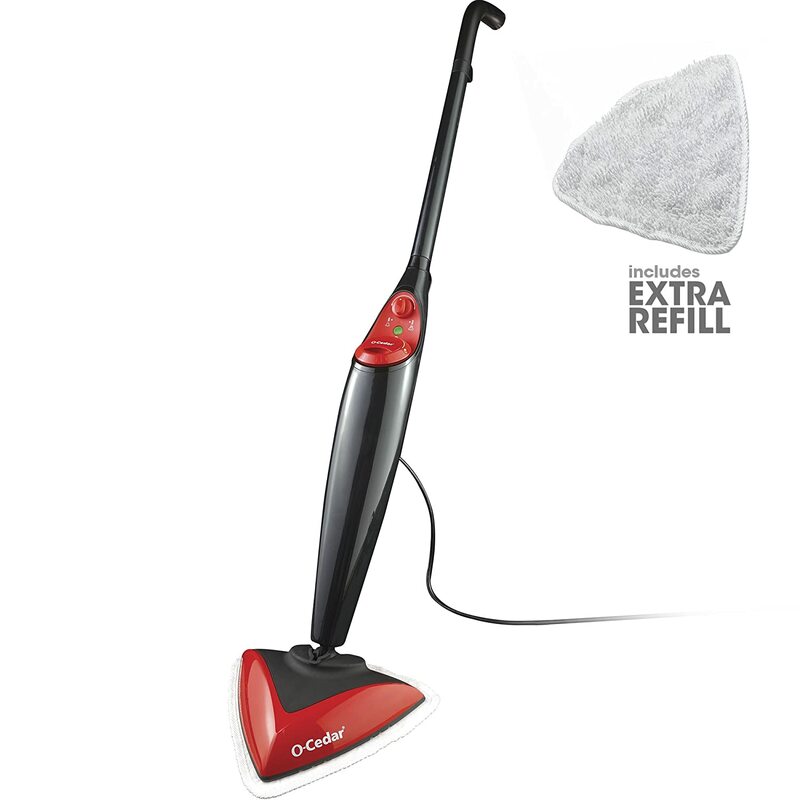 Steam mops typically weigh about 10 pounds, but that isn’t the case with O-Cedar’s steam mop. This one only weighs 5 pounds, which makes carrying it much easier. 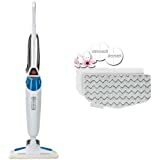 As you would expect, this steam mop has adjustable steam levels, which would help you to precisely set the steam to get the most out of the machine and also avoid damaging your floors. In terms of cleaning capacity, O-Cedar Microfiber Steam Mop is excellent. It is fitted with a triangular head, making accessing far corners under furniture much easier. Besides, it comes with a snap-on carpet glider to allow you to take care of your carpets. 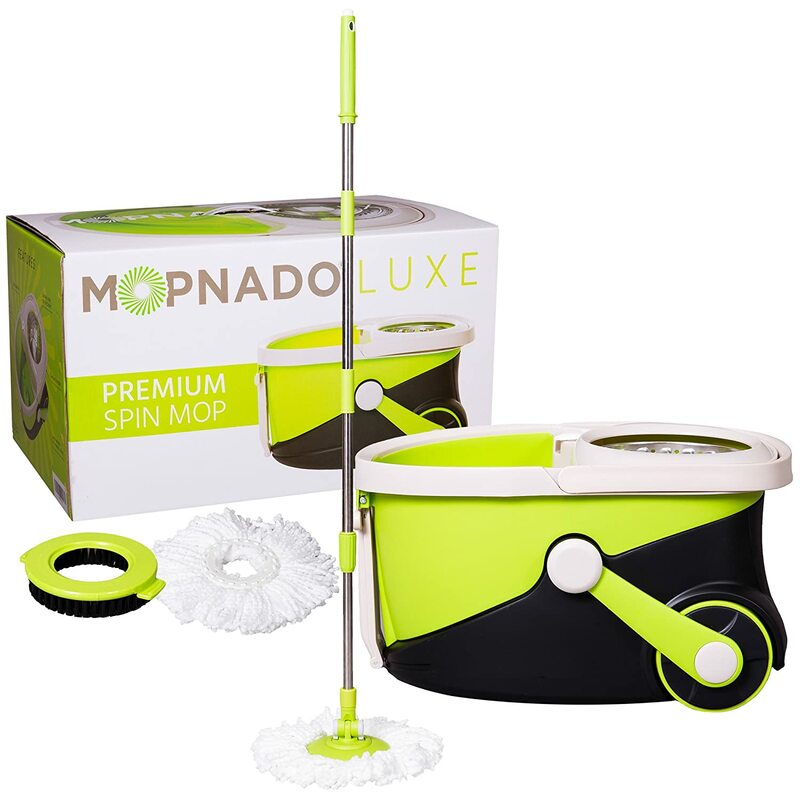 Mopnado Stainless Steel Deluxe Rolling Spin Mop shines when it comes to convenience. It is designed to help you with getting the most out of each of your cleaning sessions. The most remarkable thing about this mop is the included Mopnado mop bucket. It has two compartments: one for rinsing and the other for drying the mop pad. Apart from that, it is equipped with a cleaning solution dispenser for quick mixing with water. What many users like about the Mopnado bucket is that it allows squeezing the mop pad as much as you need. If you push the handle up and down quickly, the mop head will spin very fast and thus completely dry the mop pad. That’s what you need for laminate floors. 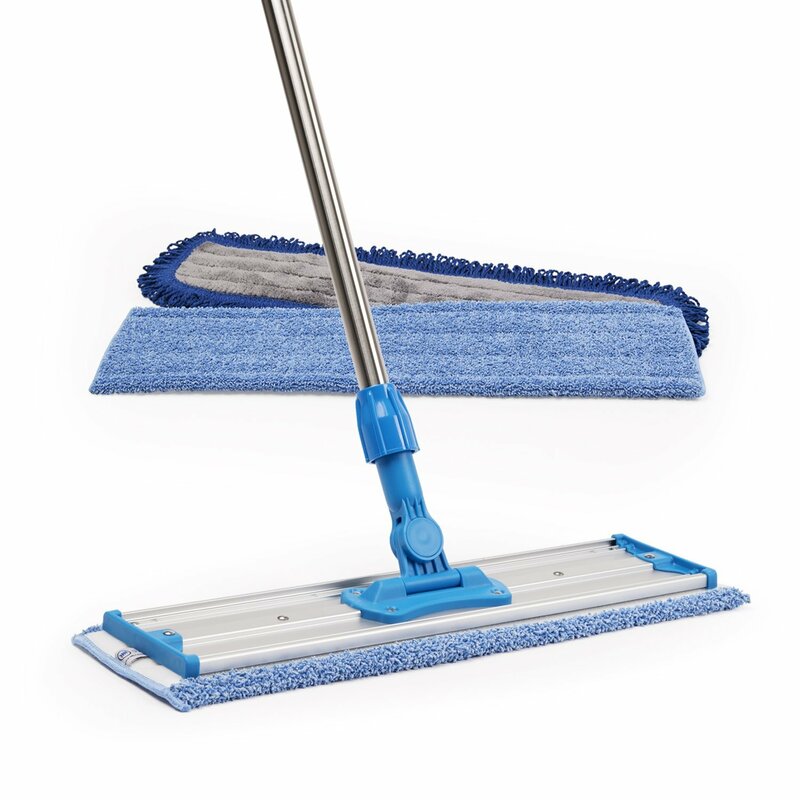 The Deluxe mop also allows you to quickly switch between mop pads thanks to its simple snap-on mechanism. 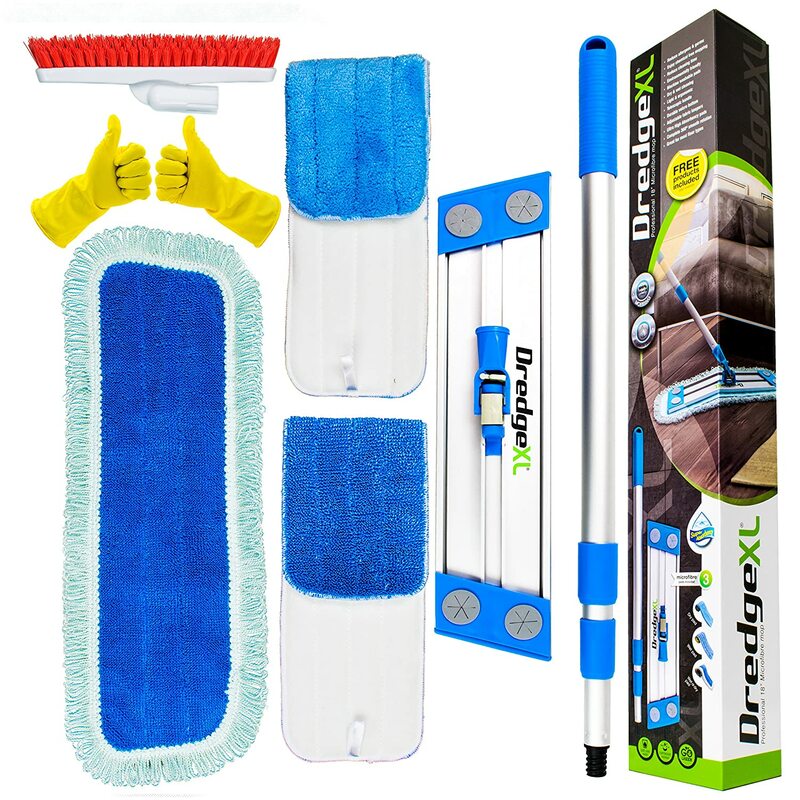 And all in all, Mopnado Deluxe mop is an ideal choice for those who want to save as much time as possible. 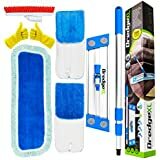 Includes 2 soft mop pads and 1 scrub brush. Making your laminate floor as shiny as this is not impossible. Just buying a floor mop and occasionally sweeping your laminate floors isn’t enough to ensure the longevity and good looks of the flooring. There are a couple of things that you need to take care of when looking after your laminate flooring. 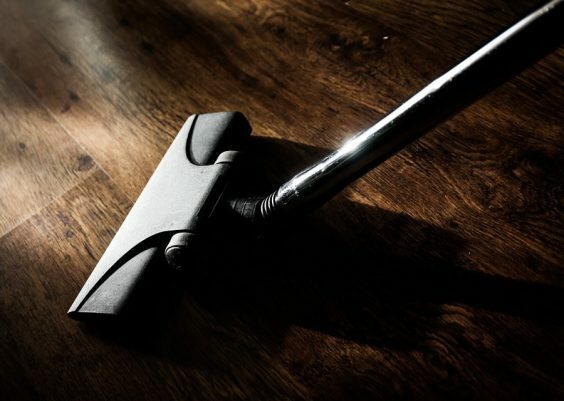 Make sure to regularly sweep your laminate floors clean from dust, dirt, hair, and other debris. 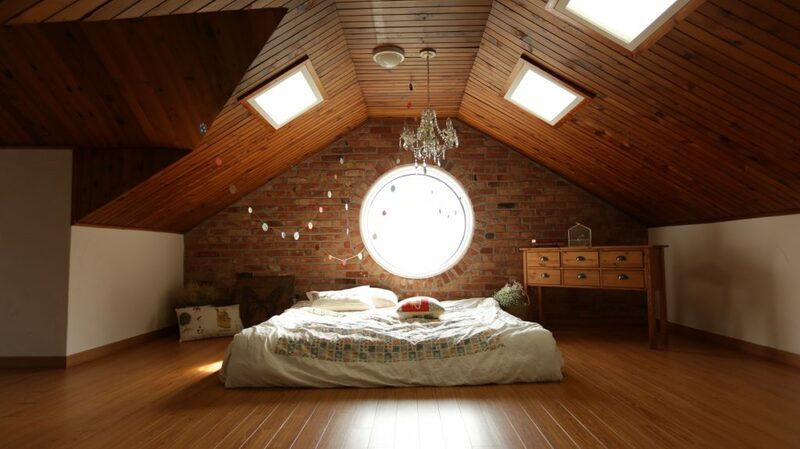 If those build up on your laminate flooring, they could cause scratches and blemishes. 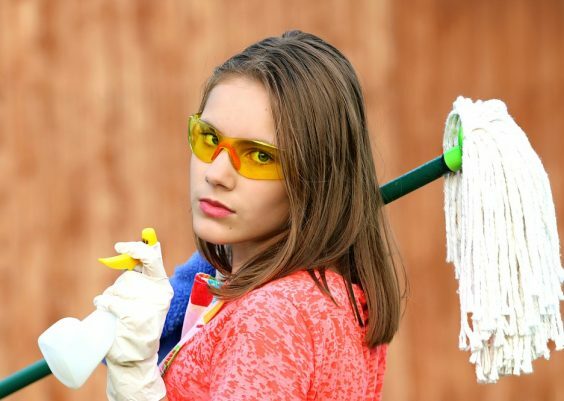 Apart from that, if you sweep regularly, you won’t have to one day spend hours on getting rid of all the dirt that has been accumulating for weeks. 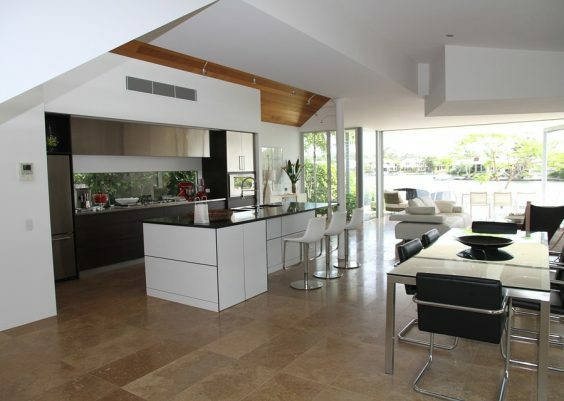 You don’t want to allow water or any other liquid to sit on the laminate floor for prolonged periods. The liquid can damage and stain the protective layer of the laminate flooring. Similar to cleaning spills, don’t use too much water when cleaning your laminate floors. The porous nature of laminate will result in the water soaking in, which won’t do any good for the laminate. This also means that you will need to dry the laminate flooring after you have cleaned it with a wet floor mop. If you have got yourself a spray mop or are just using the good old bucket-mop combo, make sure to not use strong cleaning solutions. These could damage the laminate flooring and would also probably leave a strong odor in the room. There you have our laminate floor mop guide! Did you find the best mop for laminate floors? If yes, don’t waste any more time and go get it! If no, don’t be afraid to put a bit more time into your search. Sooner or later, you will find the ideal laminate floor mop! Flikandcompany.com is a participant in the Amazon Services LLC Associates Program, an affiliate advertising program designed to provide a means for us to earn fees by linking to Amazon.com and affiliated sites as well as to other websites that may be affiliated with Amazon Service LLC Associates Program. Flik & Company Copyright © 2019.